Living in the ulu east of Singapore, it is always a delight when a friend suggests to meet up at an eatery near my place. Near my place you say? Yes! Moohehe. Seeing that I now have moore time and less money, I figured I might as well take a leisurely walk to The Catch, a seafood restaurant nestled within a cluster of prisons. It was a catch up with foodie friends and that can only mean one thing- a great yummy time! La La Boiled in Chinese Wine ($14 for small portion; the above was about 1/5 of the small portion) featured clams in a delicate and appetising broth of Chinese wine, ginger and strips of black fungus. Originally wanting to order Flower Crabs, we opted for the Mud Crab Steamed with Chinese Wine & Egg White ($6.80/100g) as the former was unavailable that evening. I am not a big crap crab person but did enjoy its clean, sweet complementary flavours. Reserving some of the egg white, we separately ordered a plain wok-fried bee hoon to soak up all those lovely juices. I was intrigued when told that the mee pok is a moost try here. Instead of the common bak chor mee version, it appeared as Braised Noodles with Seafood in XO Sauce ($28 for large portion). The depth of flavour was solid in this one! I could inhale the whole plate but had to restrain or risk ruining friendships. Moohaha. As a second carbs dish, we had the "Yuan Yang" Poached Rice with Seafood in Superior Broth ($24 for small portion). I didn't take a photo but posted an Instagram video here. See and hear the puffed rice sizzle upon hitting the hot soup! An organic Gerard Bertrand Autrement Sauvignon 2012 from the South of France boasting citrus notes and medium acidity was the night's tipple. With good food and a unique location (moohehe), The Catch is certainly a good catch! Hey by the way the owners are seafood suppliers hor, so you can be guaranteed of fresh seafood. Chew On This: Feel free to BYO. Corkage-free! I was running 10 minutes late for dinner and was terrified that Gordon Ramsay would make me an idiot sandwich. Moohaha! But thankfully that wasn't on the menu at his newly opened restaurant Bread Street Kitchen at Marina Bay Sands. Bread Street Kitchen, his first restaurant venture in Singapore, is a casual duplex with a balmy waterfront-facing dining space with a bar on level one and a moore intimate private dining area on basement one. Here's moo take on the experience at the media diner. We started from the "Cold Starters" section of the menu, A take on the Italian classic, the Roasted Veal Carpaccio, Dill Pickles, Quail's Egg, Tuna Dressing ($26) was delightfully scrumptious with thin, lightly chilled slices of veal still spotting a blushing pink accompanied by a balanced slightly acidic tuna sauce. The Spicy Tuna Tartare, Chilli, Garlic, Sesame Oil, Wonton Crisps ($19) had a touch of local flavours that were familiar and easy to relate to while the Potted Salt Beef Brisket, Grain Mustard, Piccalilli, Caraway Crackers ($19) boasted bold flavours with a punchy mustard note. The beef brisket was coarse and a tad dry. Piccalilli, essentially pickled vegetables similar to achar, cut the richness nicely. Then suddenly there was a flurry of excitement which drew my attention to the other end of the table. Standing there was the man himself who came to check on how dinner was progressing. It was surreal being in the same dining room as Gordon Ramsay and the fact that he "complained" that it was far too quiet at the table probably reflected how mooch we were in awe (or some said terrified) of him. Moohaha. Mooving on to the hot starters, the Flatbread, Butternut Squash, Taleggio Cheese, Mushrooms, Pine Nuts, Basil Pesto ($20) was simple and enjoyable with a medley of sweet, meaty and herb flavours. The Tamarind Spiced Chicken Wings, Spring Onions, Coriander ($18) drew mixed reaction at the table. Some felt it was slightly bitter while others said the tamarind was indiscernible. I agree with the latter but looking past its name, I did enjoy this tasty dish which somehow reminded me of a cross between Marmite chicken and Japanese curry. Moohehe. Except of course this wasn't a fusion dish at a cze char stall but Gordon Ramsay's restaurant. Then Miss Tam Chiak flashed. Ahem. Not what you're thinking lah! The mains landed on the table and presented themselves. The Slow-Roasted Dingley Dell Pork Belly, Spiced Apple Puree ($28) was my favourite among these. Leaning towards the well, lean, side, it had a good bite and was still tender and flavourful. Its skin was crisp and almoost crunchy. The dish went well with the pretty safe spiced apple puree but it worked. The Traditional Fish & Chips, Crushed Peas, Tartar Sauce ($26) was disappointing. The fish was meaty and moist but the crust could be moore crispy and without that heavy, oil flavour. The Lamb Chops ($48) were simple and cooked perfectly though nothing terribly exciting. Sides were also available. The Macaroni Cheese with Garlic Roasted Crumbs ($16) was creamy and rich with pasta that retained their texture. Spiced Honey Carrots were like delectable sweet orange sticks of Christmas spices. Roasted Black Cod with Crushed Potatoes, Salted Capers, Artichoke, Red Wine and Lemon Sauce ($44) was one of my favourite main courses. The fish skin could do with a better crisp but the flavours of the dish as a whole all came together beautifully. Order up drinks from their bar which can whip up off-menu specials such as this Shiraz-based giant of a cocktail. This is what I will have if I limit myself to only one drink. Moohehe. Desserts were served in a combine platter for our tasting purpose. Beginning from left to right: The Monkey Shoulder Cranachan Cheesecake with Roasted Balsamic Strawberries ($18) was creamy and rich. My personal favourite was the Coffee and White Chocolate Parfait with Poached Blackberries ($18). Boasting varying textures and flavours, it had oomph while being balanced. The Chocolate Fondant with Salted Caramel and Mint Chocolate Chip Ice Cream ($20) was a classic pairing of chocolate and mint. Like the chunky bits of chocolate in the mint ice cream. The Pineapple Carpaccio, Passion Fruit, Coconut Sorbet ($15) would be great for someone who enjoys ending the meal on a refreshing, lighter note. Then just when we thought it was over, the Treacle Tart ($18) appeared because Gordon said that "this is the dessert to go to bed with". It was my first experience with Treacle Tart. Very homely; sweetness was quite intense with a slight caramelised sugar flavour. 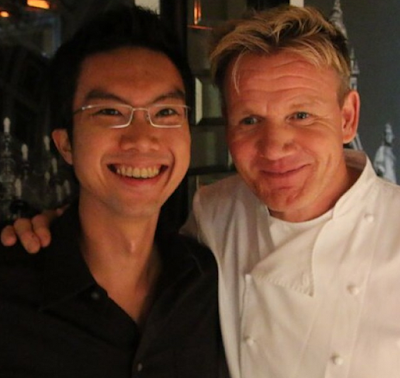 Photo with Gordon Ramsay (priceless). I am seldom star struck but I guess having watched one too many episodes of MasterChef, MasterChef Junior and Hell's Kitchen, I couldn't help but to beam like an idiot at this photo opportunity. Moohehe. Thanks to Amy Kim and Sara Varela from MBS for the invitation, and to Camemberu for that photo with Chef Gordon. Chew On This: Watch out for a brunch menu soon!